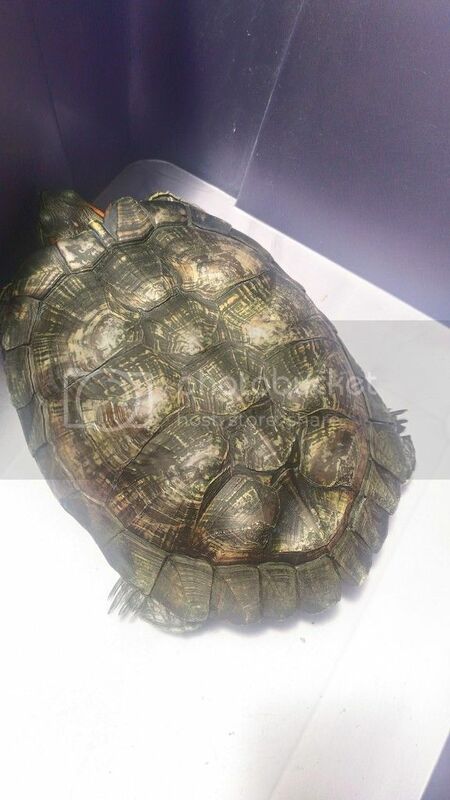 Redearslider.com :: View topic - URGENT PLEASE shell rot or shedding or fungus?? Urgent Care :: URGENT PLEASE shell rot or shedding or fungus?? Posted: Tue Apr 10, 2018 9:57 am URGENT PLEASE shell rot or shedding or fungus?? Hello, I have this turtle since elementary school. My father bought her (?) and her brother (her brother sadly died because she killed him). Sadly my father is one of the people who think turtle is an easy pet and they don't grow big. In my country, there's a lack of education here about animals. I finally taken notice what I've been doing wrong since she had an eye infection when I'm starting college, fortunately I managed to heal her. But I finally set her a proper setup last week after I managed to have time, money, and permission from my mother, also I postponed this for about a year due to my declining health issue because no one in home want to take care of her and I'm not capable to do that because of my health. I noticed she had a shell rot in her belly when I was brushing her. I touched the area and it's soft. I started to clean her, put betadine, and drydocking her. Day 2 it's already hard again (today is day 3) but I still continue the treatment. I noticed that something is strange when she's dry because the skin in her belly kinda like peeling? But it's a weird shape of peeling. I'm confused if it's a shell rot or shedding or fungus. Last edited by FreyaReniel on Fri Apr 13, 2018 4:43 am, edited 1 time in total. Posted: Tue Apr 10, 2018 11:58 pm Re: URGENT PLEASE shell rot or shedding or fungus?? The first problem is there are too many retained scutes. You can delicately remove some, but you need to do that and clean up the shell a bit. Retained scutes cause other problems, primarily infections on the scutes and seams below it (by trapping water and crud). Posted: Wed Apr 11, 2018 2:04 am Re: URGENT PLEASE shell rot or shedding or fungus?? I see. She's starting to shed but it's just a little bit of peeling. I guess I will focus to help her shedding first. Posted: Thu Apr 12, 2018 12:57 am Re: URGENT PLEASE shell rot or shedding or fungus?? You might need a second pair of hands to help hold her, and you might be peed on if you hold her too long (and scratched/bitten). Are the scutes lifting up? Posted: Fri Apr 13, 2018 4:46 am Re: URGENT PLEASE shell rot or shedding or fungus?? It seems my reply went missing. Anyway, her scutes some become loose, the most being about 20% loose, some still intact. But her scutes become more brown, not much difference but still noticeable a little bit. I guess it's the result of brushing her scutes everyday and drydocking her. I've also ordered Hikari Wheat Germ and made jello shots but this time from this forum recipe for turtle shedding inccorectly. My question is, her shell rot no longer soft but there's some pink color there. Should I continue the treatment with betadine until it goes away? Posted: Sat Apr 14, 2018 5:56 am Re: URGENT PLEASE shell rot or shedding or fungus?? A lot of the retained scutes might be hiding what's going on underneath. They are loose nut not coming off and trap water/debris which can be a breeding ground for infections. Can you post updated pictures of any problem areas? 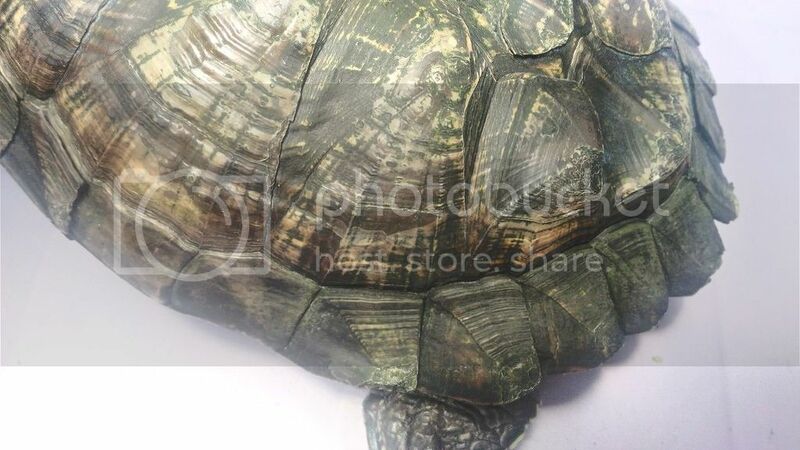 Posted: Sun Apr 15, 2018 12:57 pm Re: URGENT PLEASE shell rot or shedding or fungus?? My turtles have been shedding their scutes since what seems like forever. The sheddings are dark green in color and are film like in appearance. I am concerned if the excessive scute shedding is the cause for an underlying infection of some sort.Please help!!!! Posted: Sun Apr 15, 2018 8:05 pm Re: URGENT PLEASE shell rot or shedding or fungus?? Can you post pictures? Scute shedding is rarely excessive. 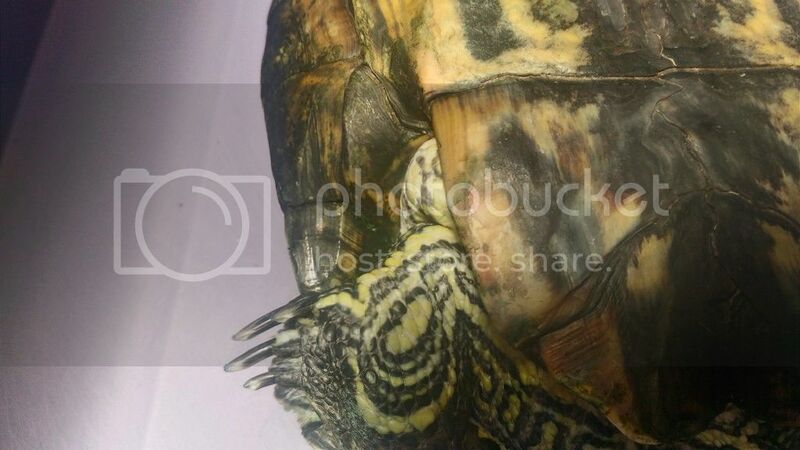 Posted: Wed Apr 18, 2018 8:36 am Re: URGENT PLEASE shell rot or shedding or fungus?? Hello, I'm sorry for replying late. Here's the update for her shell rot. As you can seem there's a little bit pink spot but it's still hard. Posted: Wed Apr 18, 2018 1:17 pm Re: URGENT PLEASE shell rot or shedding or fungus?? 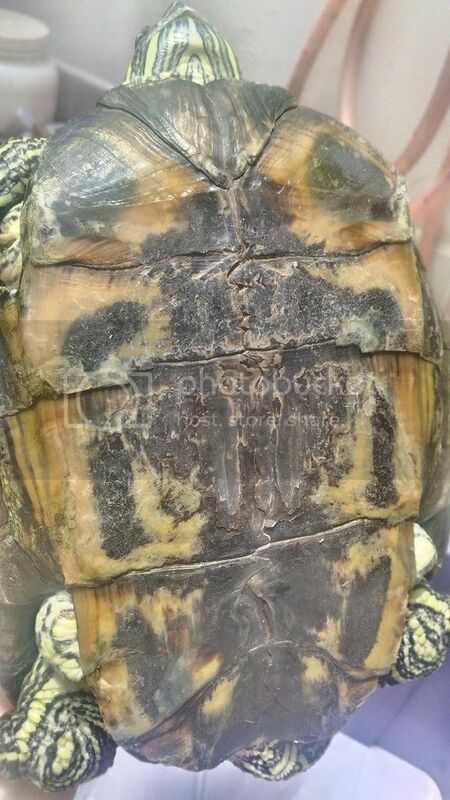 Not sure if that pink area indicates shell rot, have you noticed it change color/shape? Posted: Sat Apr 21, 2018 10:31 pm Re: URGENT PLEASE shell rot or shedding or fungus?? 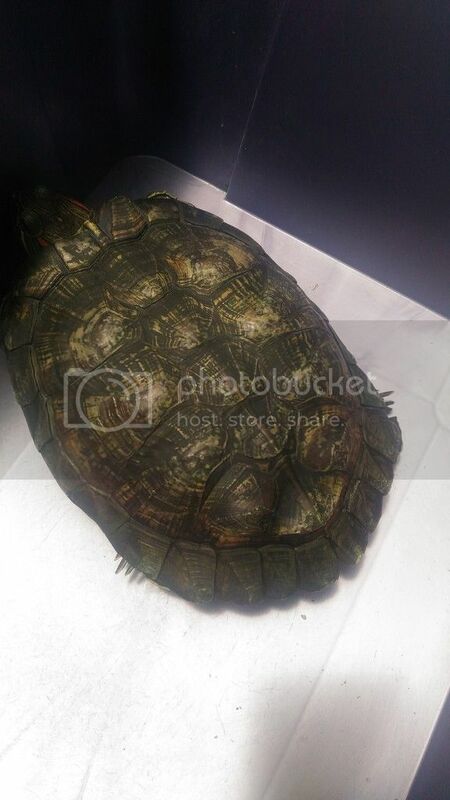 Posted: Sun Apr 22, 2018 12:14 am Re: URGENT PLEASE shell rot or shedding or fungus?? Pretty unusual for it to change hardness. I would consider veterinary help for that, it really shouldn’t happen. 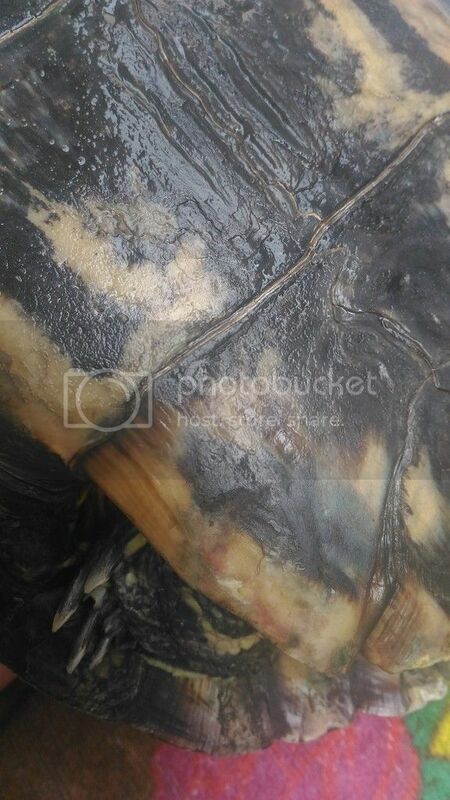 Posted: Sun May 06, 2018 10:04 am Re: URGENT PLEASE shell rot or shedding or fungus?? Posted: Mon May 07, 2018 4:40 am Re: URGENT PLEASE shell rot or shedding or fungus?? Posted: Fri Jun 22, 2018 10:55 am Re: URGENT PLEASE shell rot or shedding or fungus?? Update: today I bought her java moss, when I finally checked on her she's not greeting me. Usually she does if she heard a noise she will wake up. I'm not too bothered by this but when I finally put java moss.....I noticed she's not moving at all and her eyes are half open. Immediately get her out of water but so far....no response. I think she's dead. Gonna check it again tomorrow morning but kinda sure she's dead because she never hibernates and I'm in tropical country.